Surrounded by a legion of Beliebers, who were all clearly totally unfased by the news One Direction are officially a member down, Justin then burst out with: “Zayn's gone? Noooooo! That was my favourite Directioner!” We're detecting some slight sarcasm there but still, who'd have thought it? One Dirtection and Justin Bieber haven't exaclty seen eye-to-eye. Band mate Liam recently responded to a Belieber who tweeted Payne directly about the Biebs being more successful than One Direction. He retorted: “How many times have I been arrested?” Buuuuurn! Perhaps the pair can hookup for a cheeky collab? Despite telling fans that he left to live “a normal life” Zayn has already headed straight for the music studio, confirming to The Sun that he'll be embarking on a not-so normal solo career after all. He told the paper that he hadn't been happy in the band for a while now, adding in the words of fellow boy band walker Bryan McFadden, it just wasn't “real to me”. Zayn made his decision to quit in a public statement on Wednesday, which read: “My life with One Direction has been more than I could ever have imagined. But, after five years, I feel it is the right time for me to leave. I'd like to apologise to the fans if I've let anyone down, but I have to do what feels right in my heart. One hashtag caused quite a stir on Twitter and it looked like One Direction fans could be facing yet another twist in a very eventful fortnight. Mel B has said the Spice Girls are still one “big happy family”. John Lennon’s first wife Cynthia died today at her home in Spain, her family said. Photographer Jeffrey Binion seeks unspecified damages in the 2013 lawsuit claiming he was assaulted by a Bieber bodyguard outside a recording studio. Singer Joni Mitchell is in intensive care in hospital and fans have been asked to “light a candle” for her. Kesha has asked for Dr. Luke's request to be thrown out. Carrie Underwood shared the first public photograph of her baby son on her Instagram account on Sunday (29.03.15). Ed Sheeran has hired his first bodyguard. 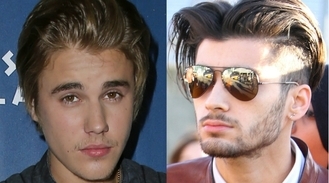 No one is as heartbroken that Zayn has left One Direction as Justin Bieber.